Gartner Magic Quadrant Business Intelligence has been released. BI platforms are now classified across three core dimensions, BI Analytics, Information Delivery and Integration. Cloud BI is always on the ascendancy but for all the focus on the world of cloud these days, again the 2017 Magic Quadrant is lacking in cloud solutions. 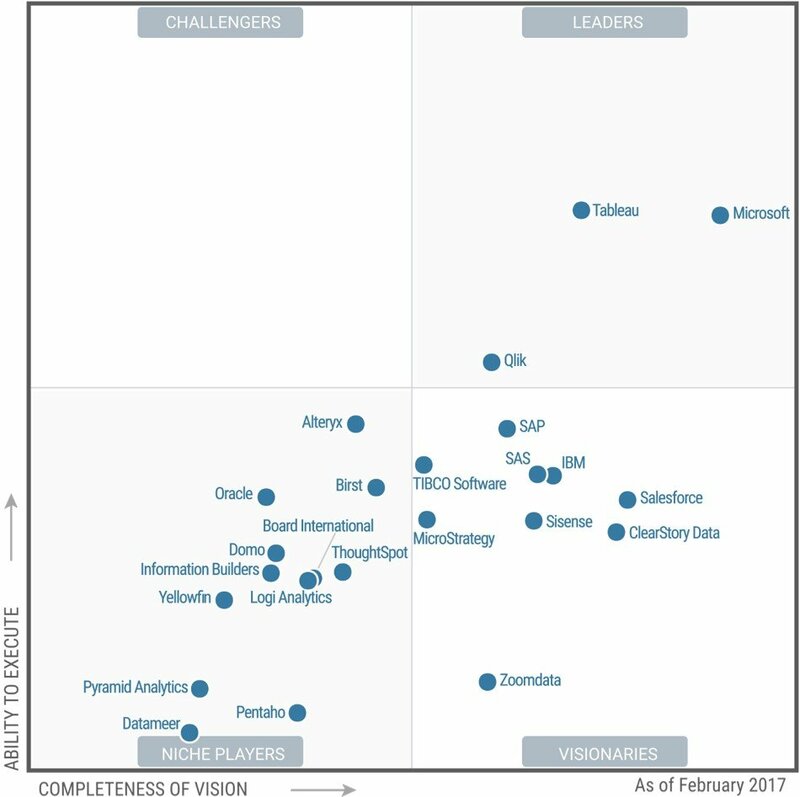 Microsoft breaks through in the Gartner Magic Quadrant for Business Intelligence and Analytics Platforms due to the innovation they’ve delivered with Microsoft Power BI (read our Power BI Review here) in the past year. 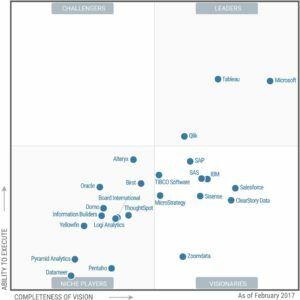 The annual report evaluated 24 different software vendors on 15 critical capabilities and places Tableau in the Leaders quadrant and continues to grow it’s user base aggressively with a product that gains user plaudits. Tableau is also the most reviewed Business Intelligence and Analytics Platforms vendor on Gartner Peer Insights, a platform where IT professionals and end-users can post verified reviews. Tableau has been recognized for focusing on customer experience, with improvements in scores on business benefits and continues to be perceived as the modern BI market leader — still slightly ahead of Microsoft on overall execution. The Gartner Magic Quadrant for Business Intelligence and Analytics Platforms graphic was published by Gartner, Inc. as part of a larger research document and should be evaluated in the context of the entire 2013 Gartner Magic Quadrant for Business Intelligence and Analytics Platforms document. The Gartner document is available upon request from Gartner. Gartner does not endorse any vendor, product or service depicted in its research publications, and does not advise technology users to select only those vendors with the highest ratings. Gartner research publications consist of the opinions of Gartner’s research organization and should not be construed as statements of fact. Gartner disclaims all warranties, expressed or implied, with respect to this research, including any warranties of merchantability for a particular purpose.